Combine all ingredients and simmer for 1 hour. Strain. Bake baking soda for 45 minutes at 250 degrees to increase alkalinity. Dissolve soda and salt in warm water. Combine ingredients in mixer and mix until incorporated. Either pull noodles or roll out with pasta roller and cut. Dehydrate orange peels overnight. Grind everything together in a spice grinder. Warm chili flakes and sliced garlic in oil over low heat until garlic is golden brown. Let stand 15 minutes and then strain. To Finish: Heat chili oil in sauté pan until shimmering. Add shrimp and pork belly, turning until golden brown. Add broth and simmer until shrimp are just cooked (30 seconds). Boil noodles in separate pot of water. Add noodles to bowl first. Place shrimp and pork belly around noodles and then add broth. Add the rest of the garnishes and serve. 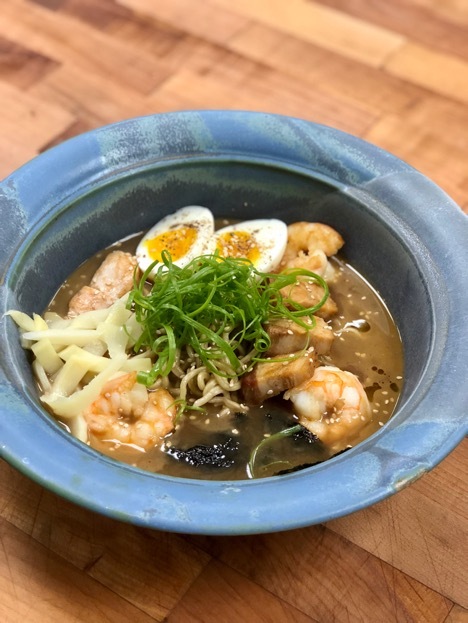 Recipe by Chef Advocate Austin Sumrall. Click here to learn more about Chef Austin!